Chris Ware draws comics – but not the kind of comics you know. Chris Ware’s comics are about sad children, lonely outcasts and depressed superheroes. In meticulously and painstakingly detailed artwork, they draw the world as a dark and lonely place in suitably muted shades. It is a world of defects and deficits, of social isolation, emotional pain and personal failure in modern life. 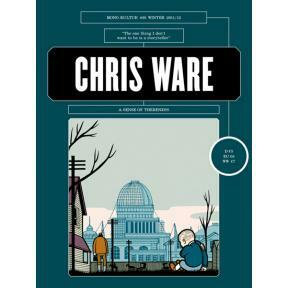 And yet, they are so utterly intriguing and hopelessly charming that one can’t help but feel something akin to true joy when reading Chris Ware. Working as an illustrator to many venerable titles, such as The New Yorker, it is with his graphic novel ‘Jimmy Corrigan – The Smartest Kid on Earth’ that Chris Ware gained worldwide acclaim, beyond the usual comic circles and was in fact the first graphic novelist to be awarded the Guardian First Book Award in 2001, as well as being the first comic artist invited to participate at the Whitney Biennial. Since then, he has been developing a series of ongoing stories over hundreds of carefully crafted pages in his self-published Acme Novelty Library, while the boundaries of comics as we know them quietly extended a little further outwards. Chris Ware talked with mono.kultur about writing versus storytelling, the death of irony and our collective refusal to grow up. This issue comes with a beautiful concertina for an overview of Chris Ware’s artwork, folding and unfolding in ever so many ways. "The intimate interview looks at every aspect Ware’s illustrious career and includes great insight to his work — a must-have for any Ware fan!"